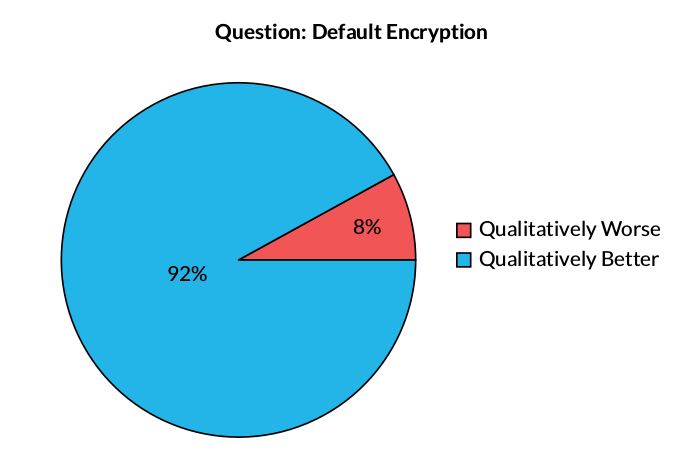 Figure 1: This chart illustrates the percentage of question responses for Default Encryption. Qualitatively better question responses indicate the application or service does use encryption. Qualitatively worse question responses indicate the application or service does not use encryption. California Data Breach Notification Requirements, Cal. Civ. Code §1798.81.5 (a person or business that owns, licenses, or maintains personal information about a California resident is required to implement and maintain reasonable security procedures and practices appropriate to the nature of the information, and to protect the personal information from unauthorized access, destruction, use, modification, or disclosure). Children’s Online Privacy Protection Act (COPPA), 16 C.F.R. Part 312.3(e) (an operator must maintain the confidentiality, security, and integrity of personal information collected from children). 36 Family Educational Rights and Privacy Act (FERPA), 34 C.F.R. Part 99.31(a)(1)(ii) (An educational institution must maintain physical, technical, and administrative safeguards to protect student information). Student Online Personal Information Protection Act (SOPIPA), Cal. B.&P. Code §22584(d)(1) (an operator is required to implement reasonable security procedures, practices, and protect student data from unauthorized access, destruction, use, modification, or disclosure). California AB 1584 - Privacy of Pupil Records, Cal. Ed. Code §49073.1(b)(5) (a local educational agency that enters into a contract with a third party must ensure the contract contains a description of the actions the third party will take, including the designation and training of responsible individuals, to ensure the security and confidentiality of pupil records).